Gone are the days where we couldn’t find suitable backpacks for our wheelchairs, now you can simply choose the best, light weight wheelchair Bags and Backpacks and and travel hassle free anywhere. 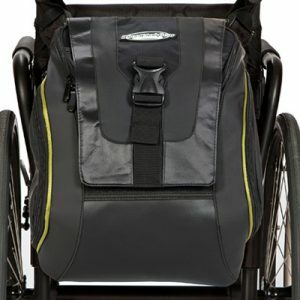 We at Wheelchair Gear create backpacks that are compact and sturdy, but we also have No-Slip Grip-Clip wrap around strap with a solid aluminum spring activated carabiner clip which helps you carry stuff on the front tubing of your wheelchair without it sliding down your wheelchairs frame. 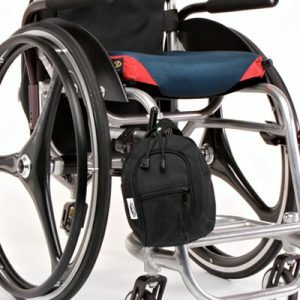 Well, first of all, ordinary backpacks won’t do for us, that is why you should look for wheelchair bag that is designed and created by wheelchair users (because unlike normal backpacks and bags, we know what we need in a backpack, and we also know how we use our wheelchair on daily basis). Once again, normal backpacks will not cater for our daily requirements. Depending on your choice and wants, multiple compartments that are designed to expand for a bigger space maybe ideal for you. The operational ease and easy access is better with compartmentalization, highly customized storage spaces and compartmentalized backpack designs are better if you require transporting various large items such as Laptops as they can be stored in padded cushion for safety. Side of your wheelchair can hold water bottles, our mini pack range with quick access zips are a safe place for mobile phones and electronic devices for easy access and retrieval. Our range of wheelchair bags are designed to be suitable for all tastes, for example: My Pink BFF Wheelchair Accessories Backpack has bright pink colors while our The Slice Jr. Mini Pack Camo maybe ideal for nature lovers. Our Urban Wheelchair Accessories Bag range is ideal all-rounder for that professional look. But above all else, what is even more important is the quality of materials a wheelchair backpack manufacturer uses. 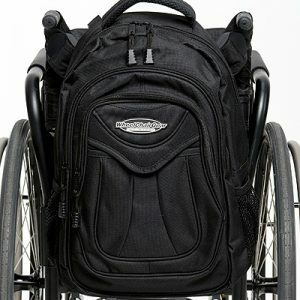 That means, you either will have a wheelchair backpack or wheelchair bag that looks okay but is created using low-quality materials and workmanship, or, you can simply choose Wheelchair Gear products that looks great, and is created using top quality materials and workmanship (as we use top quality strong garments, zips and quality stitched seams which reinforce long lasting durability). Imagine getting your student friend to lend you his or her backpack? How will you carry it? Would you place it on your lap? Hanging on the side of your wheelchair perhaps? As you can see, only those who understand and use wheelchairs themselves can truly understand what accessories we truly want and require as students who use a wheelchair. Wheelchair accessories for students are in demand as these accessories are not only fashionable but they also solve various practical challenges such as ease of access and usability issues which regular items such as ordinary bags and backpacks don’t solve. Although there are so many different accessories for different types of wheelchairs and all levels of education, let us now list the most common types of add-on for wheelchair users. Fashionable, highly functional wheelchair bags and backpacks are an everyday item for students to carry almost anything required for you to take to school (books, stationary, laptops, lunch box or even a snack). What is absolutely critical however is, usability, quality of materials used when crafting bags and backpacks, workmanship right down to the stitches and strength of thread being used and also durability. That’s the quality difference when you purchase products from Wheelchair Gear. Light weight weather guard and rain covers are usually rugged, long lasting and easy to setup, these covers protect fabric and leather padded cushions of the wheel chair as well. They can even be used for keeping dust away which often cause more cumbersome issues with our wheelchairs if parked in an open heavy traffic area. Pouches can be detachable or designed for the sides allowing extra storage for carrying various items we need during the day especially when we are out and about. Long adjustable straps can be fastened around the seat for a firm attachment. The need to carry specialized items such as medicines, or other consumables is made easy by compartmentalized smaller wheelchair bags and pouches. Studying requires energy and concentration, at times, depending on the class we are at, we may be faced with long training sessions, or perhaps sitting for an important exam means that we are stationary for long periods of time, when faced with such situations, it’s best to opt for comfortable memory foam cushions (for winter seasons, anti-heating back rests are ideal) or even padded gel cushioning for such tiresome days. In today’s technology driven classrooms, students have to use mobile devices such as tablets and laptops for learning. It is essential to carry these devices from one class to the next. Wheelchair trays may be ideal in such situations where you will need to use laptops, particularly depending on educational level. For example: college and university students will require the use technology devices such as laptops more often, that’s when a wheelchair tray would be the perfect accessory. Yes, our mums recommend that we drink plenty of water while at school studying, and that’s where water bottle holder wheelchair accessory comes handy. 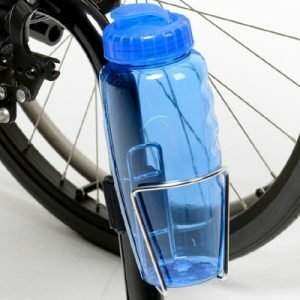 Mind you, it is important that you choose WheelChair Gear products, because when you are thirsty and want to reach for that drink of water, at least, you want your bottle to be in its place, unlike some other low-quality water bottle holder wheelchair accessories sold on the market, all our products are vigorously tested. We even have No-Slip Grip-Clip (that means: No more duct tape, wire ties or homemade devices to hang things from your wheelchair). As we know that for someone whom wheelchair is an extension of the self, accessorizing the wheelchair with easy and convenient storage options such as Wheelchair packs and pouches is definitely a value add. Today, it has become even more important to have accessible compartments for our wheelchairs; a good example would be to have a place where we can quickly store and access a set of cool glasses or reading glasses, a tablet computer, or a mobile phone perhaps. Sometimes it is also important just having an empty storage compartment to accommodate purchases while we are outside shopping. Selection of the type of wheelchair bags depends on a lot of factors particularly our own personal taste. For predominantly outdoor activities: water, heat and dust resistance of the outer material is surely more important. Post exposure to the elements and ease of cleaning needs consideration. When considering for indoor use, the colors and artistry of the product may take preference. Listed below are some of the common types of wheelchair accessories that we may find useful and enriching our day-to-day living. As the name suggests, this goes at the back of our wheelchair, so it is important to assess how securely it can be fastened to the chair, to avoid usage hassles. These are usually available as a single compartment bag where one can place anything to everything all in one, or for the more organized, they come with build compartments to help carry a laptop computer with its accessories as well. These are the ones one would love to have for quick-need grocery pickups, or even for sightseeing weekend getaway where we need to usually pack lots of different stuff. Backpacks can have generic lining or a firm walled like a box. The firm walled ones would make it simpler to carry more delicate items that otherwise would require utmost transportation consideration. The large size bags also serve greater purpose not just for the wheelchair user but also those who accompany you while out and about because larger backpacks have enough space for you to carry perhaps your friend, partner, or even children’s belongings as well. Why just have single backpack when you can equip your wheelchair with additional accessories for different reasons? 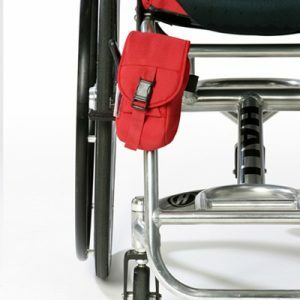 Wheelchair Pouches (we’d like to call them “MiniPacks“) are ideal solution depending on your personal requirements. With a large zippered storage compartment allowing quick and easy access for items that are usually called upon more often during the day. Unfortunately, there are many cheap low-quality wheelchair packs and pouches available on the internet. Some of these low-quality backpack creators usually do not understand that “hey, I just don’t want a wheelchair backpack” I want stylish, cool, modern, durable, usable and affordable wheelchair packs and pouches. Fortunately, WheelchairGear Wheelchair Accessories cares for the wants of wheelchair users, because we are too everyday wheelchair users. No more low-quality backpacks that look like shopping bags, no more fumbling in pockets or grasping with homemade carrying devices. Instead, browse through Wheelchair Gear backpack range for quality, stylish and above else usable backpacks designed by wheelchair users, for wheelchair users.